As far as I know this is the printable calendar smallest in the world! 5.5 x 8.5 centimeters: a whole year behind a single business card! Done! In two easy steps you’ve discovered what day will be March 19: Friday! 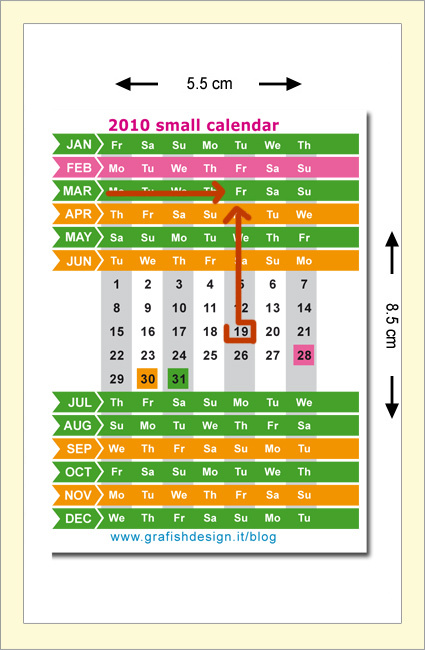 The difference in color of the months is to recall its length: in green are the months of 31 days, in orange are the months of 30 days and in pink is February that in 2010 will be 28 of days. via The small calendar 2010 (en) « Grafish Design’s Blog.